SACRAMENTO, CA (MPG) - Alsco Inc., the premier linen and uniform rental services company, recently joined the Eskaton Foundation’s Philanthropic Partner Program to better support senior citizens as they age, helping them remain independent, but also provides volunteer opportunities and education forums about the aging experience for Alsco employees. Seniors are an often overlooked demographic when it comes to charitable giving. In fact, in the United States, only two percent of all giving is directed to senior causes. 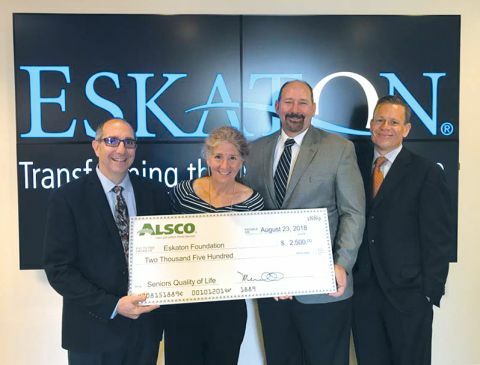 “Our donation allows us to support seniors through the innovative health, housing and social services the Eskaton Foundation provides to seniors,” says Mark Kotsios, general manager, Alsco Sacramento. Eskaton, which means “the dawning of a new day,” is a community-based nonprofit whose mission is enhancing the quality of life of seniors to transform the aging experience. Eskaton Foundation supports the needs of seniors in the greater Sacramento area. Alsco is a fourth-generation family owned and operated business, founded in 1889, that was recognized by the prestigious Hohenstein Institute for having invented the linen and uniform rental industry. Celebrating 129 years of business, Alsco provides linen and uniform rental services to customers that include restaurants, healthcare, automotive industry and industrial facilities. With over 180 locations, Alsco provides world-class service to over 355,000 customers in 14 countries. Learn more at http://www.alsco.com.